Channel 10 Eyewitness News Bullying at Work (Kindly provided by Channel 10) Nina talks about the impact of conflict at work and the launch of a free Workplace Conflict Guide at NSW Parliament House. Channel 7 Sunrise interview Keeping your cool – Sunrise (Kindly provided by Channel 7) Nina Harding appeared on Channel 7 Sunday Sunrise recently giving her view on managing emotions when making a complaint. Workplace Mediation (14mins) (Kindly provided by The Resolution Institute) Nina talks about the excitement and challenges of mediating issues in the workplace, and what managers could do to help manage disputes better. Nina has been resolving business disputes full-time for more than 20 years. 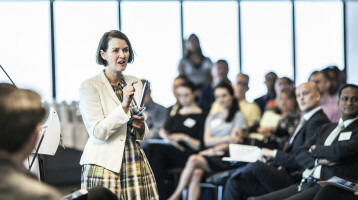 She has mediated numerous large scale disputes, hundreds of business disputes and regularly facilitates workshops on a range of issues. Please download our free iBook from iTunes, Workplace Conflict Guide written by Nina Harding, Simone Farrar and John J Whelan. Thank you for journeying through our website. Please Contact us if you have any questions.